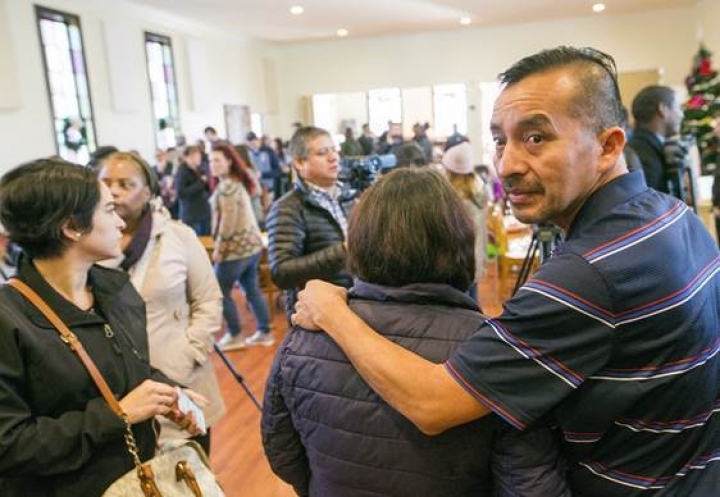 DURHAM, N.C. — A Mexican immigrant who sought refuge in a North Carolina church for nearly a year was deported Thursday, federal authorities said. Samuel Oliver-Bruno, 47, was removed from the U.S. and taken to Mexico at 8:45 p.m., said U.S. Immigration and Customs Enforcement spokesman Bryan Cox. Oliver-Bruno was arrested Nov. 23 at an immigration office near Raleigh after he left the church to have his fingerprints taken as part of an application to stay in the U.S. to financially support his son and ailing wife. His application to stay in the U.S. was denied earlier this week. He had been living in the Durham church since late 2017 to avoid immigration officers, who generally don't make arrests in churches and other sensitive locations. Plainclothes officers detained him when he entered the Morrisville office of U.S. Citizenship and Immigration Services last week. Outside the office, more than two dozen of his supporters were arrested on misdemeanor charges including resisting officers after some blocked the van being used to drive Oliver-Bruno away. ICE previously said Oliver-Bruno, who has lived in the U.S. for two decades, had no legal basis to be in the country. He pleaded guilty in 2014 to using false documents to try to re-enter the U.S. in Texas after a trip outside the country, according to court records. Since his arrest, dozens have held rallies and organized a campaign to lobby elected officials and the federal government to reverse their decision. Democratic U.S. Reps. David Price and G.K. Butterfield, both of North Carolina, had urged Homeland Security to release him, calling his treatment unacceptable.